Bay windows are defined as windows that project outward of the main walls. The name is so because it forms a bay inside the house. Bay can be defined as a space or void in the wall window between window frames or doorway between door frames. Bay windows differ in sizes: from an average sized window that a start a little below the head height or a large one that runs from ceiling to floor (full bay). The latter obstructs the regular floor shape, which may be a more costly installation because of its odd-shaped floor plan. They are commonly installed (with window seats) in front of a breathtaking scenery. Designs range from extravagant antique and Victorian architecture to sleek modern lines. They are seen on mansions of the early English Renaissance. Bay windows are usually made of three parts a picture window flanked by smaller windows on both sides at a particular angle although the number of window parts depends on the homeowner. Because of their size, bay windows ultimately bring light into a room. Double hung windows or casements windows can be used to provide proper ventilation. Bay windows not only provide space but also enough light from many angles, especially tall ones. Bay windows may range from 3-feet to 6-feet in width or in height. When replacing normal windows, it is cheaper to install bay windows with the same size as the previous. 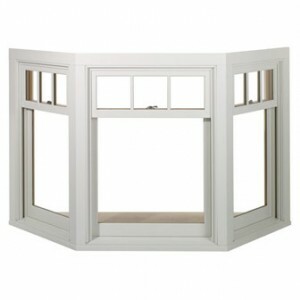 Different materials can also be used to manufacture the frames of your ideal bay windows. You just have to consider the maintenance and look of the window when choosing. Double or triple panes may be ideal for bay windows, depending on your needs. Argon gas-filled panes will help in energy conservation by slower heat conduction/convection. Because of its size, bay window should be well-supported. Use braces or steel cables; ask the manufacturer to install them for you although they can be purchased separately. If you are planning to install bay windows for your home, expect to spend around $800 to $1000, so it is necessary to go around local stores to know your options. Andersen Window Replacement offers bay windows in different colors, styles and finishes. They use High-Performance Low-E4 Glass which allows up to 56% energy efficiency during summer 45% during winter, reduces water spots through an innovative glass coating, blocks about 83% of UV radiation and lessens the sound coming into your home. Tempered glasses are also available if you are looking for durable materials. Marvin Windows and Doors presents bay windows with modern designs and wood. They offer several interior finish options such as laminated head and seat boards cut according to your specifications. You can select from different wood species such as Douglas fir, mahogany and pine. Exterior finishes come in several colors; you can also customize your own. Glasses come in Low-E panes and specialty glasses such as tinted, reeded, hammered, etched, sandblasted, laminated, etc. The manufacturer also installs SillGuard, an adjustable sill pan with a sloped surface and built-in drainage. This feature is built to direct moisture out onto the weather-resistive barrier. It is made from durable and shatter-resistant materials and is suggested for new constructions. See How Much You Can Save On Bay Windows Today! Prices of bay windows differ according to type, color, size, and features. Thus, it is necessary to compare the prices of various window brands and to put products side by side in order to see the pros and cons. Therefore, the price of the end product you will get is dependent on your careful selection and inspection.